Ansonia’s Brock Shellhaas (23) gets behind lead blocker Reece Stammen (7) for a long gain in a game earlier this season. The Tigers (7-2) have unofficially clinched a playoff spot for the second consecutive season. 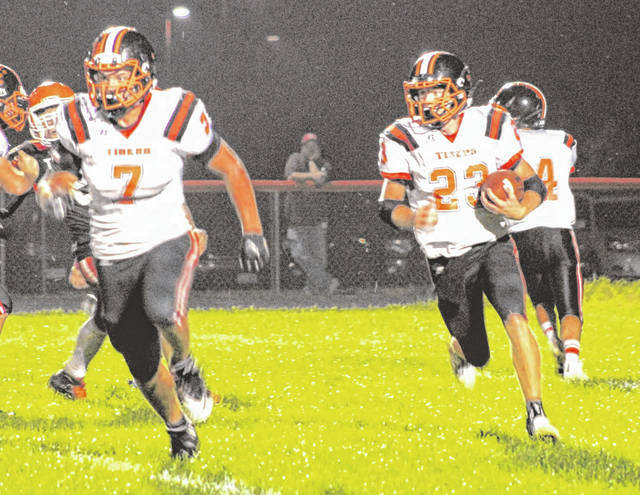 The Ansonia Tigers have unofficially clinched a spot in the upcoming football playoffs, according to the Ohio High School Athletic Association’s weekly computer ratings released on Tuesday. Through Week 9, Ansonia (7-2) ranks as the No. 3 seed in Division VII, Region 28 with a current average of 13.1444. That would give them a first-round home game, but the Tigers play winless Bradford this week so only stand to gain 3.5 points for a victory. They will not receive any second level points from the Railroaders meaning some teams under the Tigers – Minster, Riverdale, Miami Valley Christian Academy, Lehman Catholic and New Bremen – could jump ahead of them depending on how many points they stand to gain whether or not they win their Week 10 games. This will be the second consecutive season for the Tigers qualifying for the postseason. Prior to last season, the last time Ansonia was in the playoffs was 2010. The OHSAA’s final computer ratings report will be released on Sunday, Oct. 28, when 224 schools (top 8 in each region) will officially qualify for the playoffs. This entry was tagged Ansonia Tigers, CCC, High school football computer rankings, OHSAA. Bookmark the permalink.